YONGIN, Gyeonggi Province -- Despite being a late starter, Hyundai aims to take the top position in the large sport utility vehicle sector both in South Korea and in other major markets, the company said Tuesday, stressing the innovative design, high quality and state-of-the-art technology of its new SUV Palisade. Eight business days since the official launch of the new SUV on Nov. 29, the company has received 20,506 preorders. In contrast, there were only 14,000 preorders for the Santa Fe so soon after its launch. While the company is pulling out all the stops to promote the Palisade, it has not yet set a specific sales target, an official said. It has no specific sales target for the US market either, he added. The Palisade made its world debut in Los Angeles two weeks ago. The Korean carmaker spent four years developing the Palisade and bringing it to market. 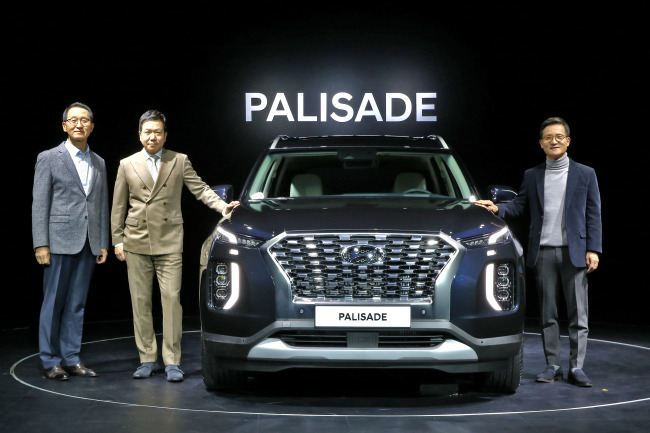 “The Palisade is not just a simple vehicle but a car where customers build their lives and add value to their lives,” said Hyundai Motor Executive Vice President Lee Kwang-guk at a test-drive event held for local media in Yongin, southeast of Seoul. Taking a vertical wedge as the key design feature for the overall car design, the Palisade used the contrasting image of horizontal elements for its interior to provide comfort for passengers, said Lee Sang-yup, vice president of design at Hyundai Motor. “It has a magnificent (look from the front) with a large cascading grille accompanied by the contrasting features of the long hood line, arch-type fenders and panoramic glass for the sidelines,” he said. While the company succeeded in carving out an unorthodox and stylish image for the Palisade by choosing top K-pop boy band BTS as the frontmen for its global reveal, it is the car’s family-friendly features -- sturdiness and efficiency -- that really sell it. The SUV with eight passenger seats has nine air bags and featured the lane-keeping assist, forward collision-avoidance assist and blind-spot collision-avoidance assist system. To enhance convenience, it has 16 cupholders, six USB ports and a large cargo space even with the third seats in place, the company said. The Palisade comes with an eight-speed automatic transmission powered by a 2.2-liter diesel engine or a 3.8-liter gasoline mill. The price ranges from 36 million won to 42 million won. All SUVs by Hyundai and Kia are named after places. The Palisade is named after the Pacific Palisade, an affluent neighborhood in Southern California. It plans to start selling the SUV in the US in the summer of 2019.